The other day, we moved into our semi-perminent site. Semi- because we’ll be there for 6 1/2 months. The winter months and off season at Hart Ranch allow for less moving. Come summer, we’ll be moving twice a month. We already had our water hose freeze when it got real cold. It’s been warm lately, but we figured now was as good a time as any to protect our precious H20. So Mark spent about an hour making sure our water won’t freeze again. It’s pretty self explanatory but the pictures are below. But first, we’ve been discussing heat tape for a few months . . .
Well did you notice that each quote had the word “tape” in it?? Ummmm yeah, me too. But heat tape is NOT tape. 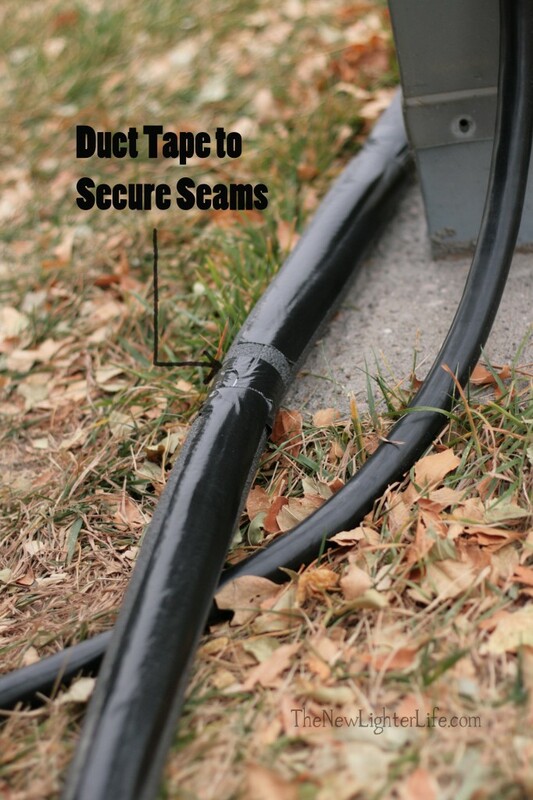 Tape implies something that bonds or has an adhesive side to it. Heat tape is NOT tape. One of life’s mysteries I suppose. Heat HOSE would be more appropriate…or heat STRIP. Heat hose tape is plugged into an outlet and it becomes a heated strip that lays against the water hose. 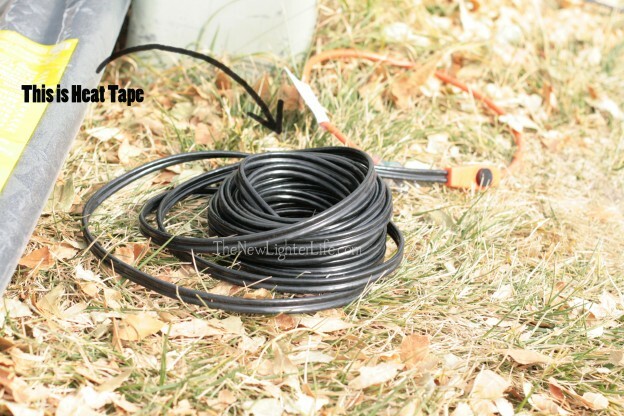 Whoever came up with the name “Heat Tape,” I’d like to talk to you. But really, I suppose I have more important things to concern myself with so….I’m sorry. First Mark wrapped the water hose with tin foil…something about conducting heat. 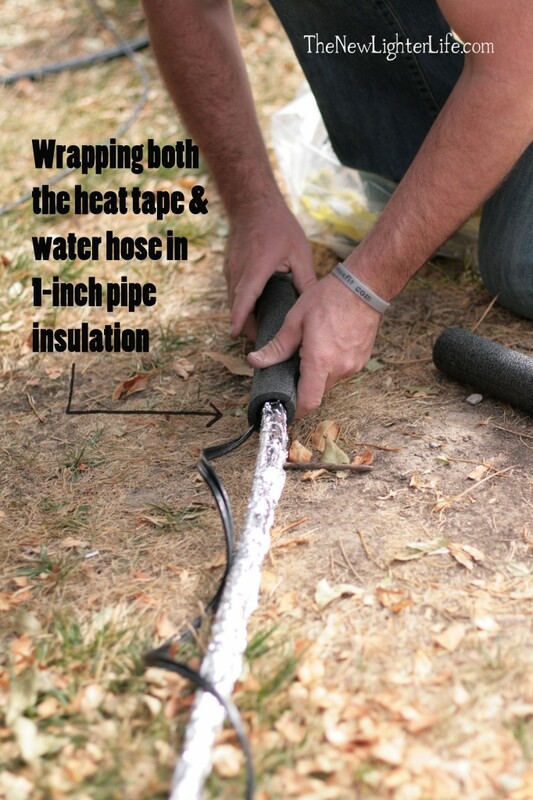 Next he wrapped both the water hose and the heat tape in 1-inch foam insulation. Here is another view. . .
How’s that for over-explaining something?? Pretty simple really. Lastly, he duct-taped the foam to secure it even further. Easy peasy. But don’t forget to plug in your heat hose tape. 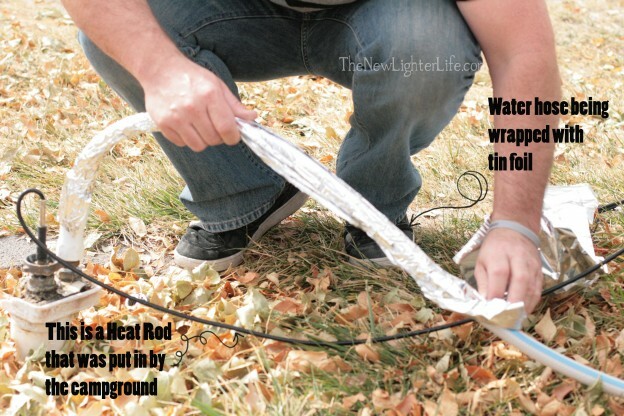 I’ve wondered/thought the same thing about heat tape! It had to have been a MAN who thought up that name! I have the heat tape? on my water hose, although the guy at the RV store told me that you can’t use it on a regular water hose; cost me $75 bucks for a “special” hose. Looks like you used a regular water hose…have you had any problems? The set-up that I have is clunky, making it hard to move the water hose around. Are you mobile or staying put in the cold weather? We are stationary so we were able to use the heat tape with a regular water hose. It sounds like you have a heated water hose, which would be way easier if you are mobile. Our waterline has stayed running except for once, when the GFI breaker on the outlet tripped (and the line wasn’t heated at all). Also we had a problem once when the connector at the park’s faucet handle froze. We’ve since insulated that with a rubbermaid tub and we need to post an update soon. The heat tape has served it’s purpose though. We considered getting that expensive hose but are pleased with the results we’ve had given our stationary hookup. I am curious as to the length that you were able to successfully do this? I know this post is super old, I hope you actually see the inquiry and reply. I am working on getting my mother set up with her travel trailer which is about 170 ft from the water source. 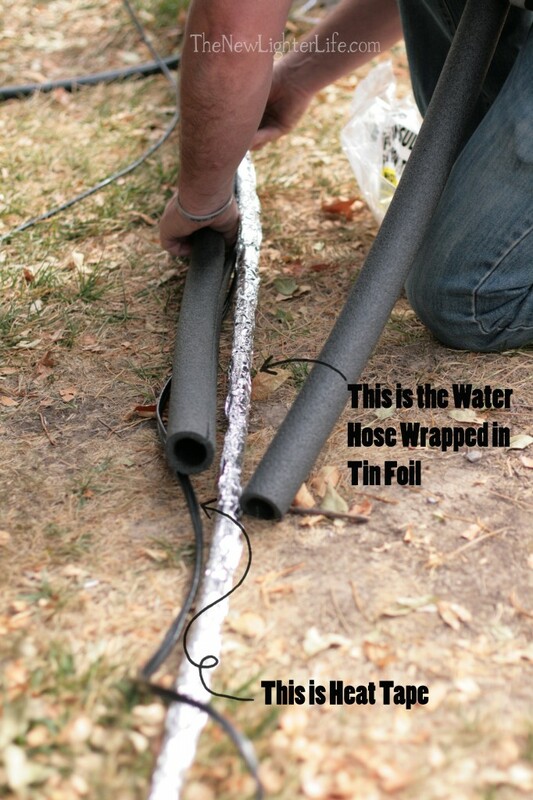 My thought was to take it one step further and add a simple framework that covers the hose that has insulation. I talked to Mark, and he said that it would be possible to do it for that long of a length. You’d need quite a bit of heat tape and to make sure to follow directions. Should work…best wishes!